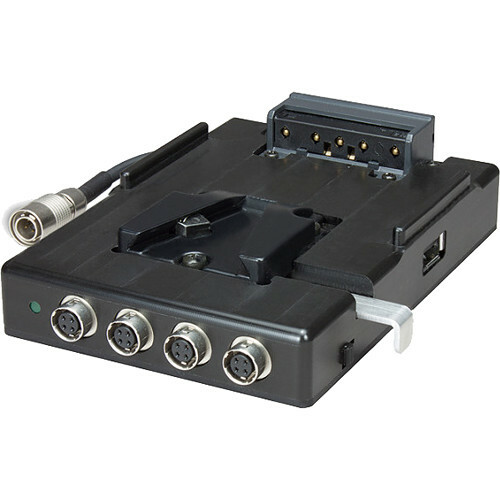 The VPAKIII V-Mount Portable Power Supply from Ambient Recording is designed for high-capacity V-Mount camera batteries, and supplies power via 4-pin Hirose connectors to up to five devices. It features a USB charger port with 10W output power, four Hirose 4-pin sockets, and an output cable with Hirose 4-pin plug connector. The adhesive hook-and-loop tape allows you to mount the VPAKIII on a recorder or mixer. The Hirose connectors are protected by a self-resetting fuse. Box Dimensions (LxWxH) 9.9 x 5.9 x 2.3"